With everything that happened this weekend in racing, both devastating and thrilling, I can’t get my mind off a little grey gelding named after a common misstatement of an iconic 1970s ad. 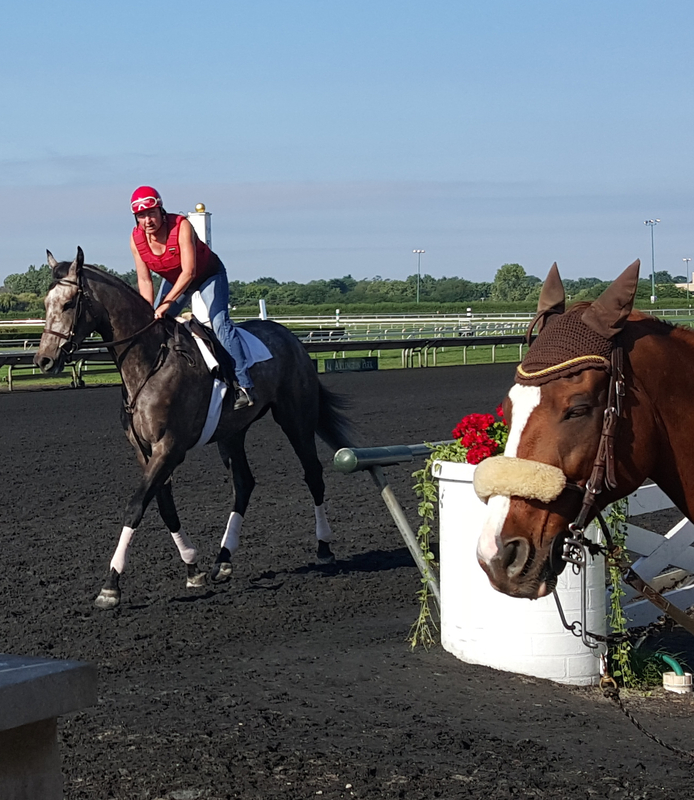 Give It to Mikey at Arlington Park morning works on August 11, 2015. The fact that Give It to Mikey stuck in my mind was a bit of a fluke. I was in the right place at the right time, standing in the winners’ circle as her rider identified him, and said he was working half a mile. Morning works are such organised chaos that unless a horse had a stakes blanket with their name on it, or had markings that I knew well enough to pick them out of the crowd (looking at you, Bandit Man! ), I did not know who most of the horses were. The name rang a bell, not just because of the famous reference, but because he had run in a couple of maiden races earlier in the summer. Hearing that tidbit of chatter meant that I had a name to correlate with his cute grey face, and a specific memory to make Give It to Mikey stand out in my mind. It makes me sad when a horse get hurt, but even more so when something happens to a horse I have seen, a horse with whom I have a particular memory attached. Things were looking good for Give It to Mikey, until they weren’t. Trying turf for the first time, racing on Lasix for the first time, and dropping into a similar class level ($25,000 maiden claiming) at which he had hit the board before, he was positioned in third. Kaner was fading, and though it did not look likely that he would catch Run Fort Run, Give It to Mikey was primed to get up for second, and complete the grey horse exacta. But, a few strides before the wire, he went wrong in his right rear leg. He crossed the wire in third, but it was as he was being pulled up. I can try to hope for the best, but it did not look good. He could not put weight on his injured leg, and there was such difficulty getting him onto the van. I feel awful for Give It to Mikey, just four years old when his leg betrayed him. I feel awful for his trainer, Debra Lokanc, whose only two starts as a trainer were his last two races. I don’t know her, or the story of how she started training this horse, but her record leaves a good chance that he was her only horse, or one of very few. Hug your horses, if you have them. They’re special, and they can be special to racing fans for the most random and unexpected of reasons. I did not know Give It to Mikey personally, but seeing this cute grey with a goofy name get hurt just as it looked like he was figuring the whole racing thing out was the worst.